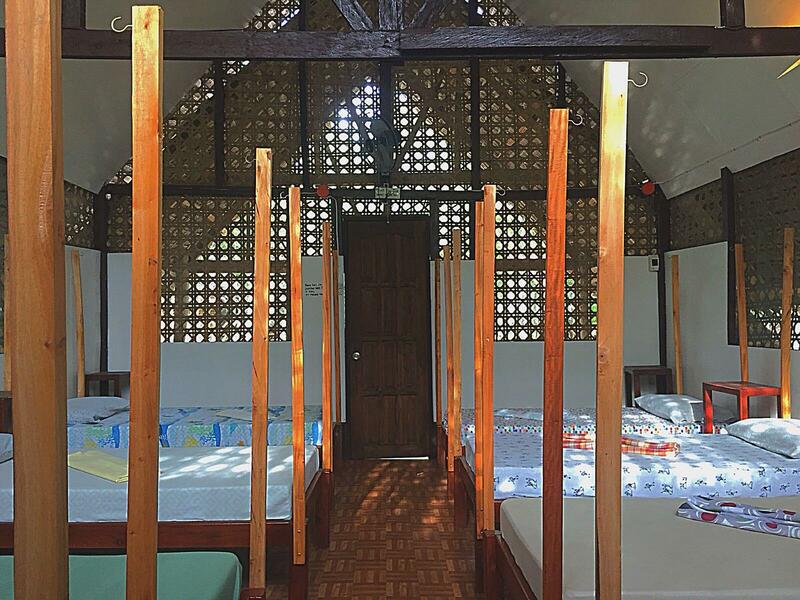 Heeft u een vraag voor Bohol Coco Farm Hostel? Goed gelegen in Panglao eiland, is het Bohol Coco Farm Hostel het ideale vertrekpunt voor uw excursies in Bohol. Het stadscentrum is slechts 20.8 km verwijderd en het vliegveld kan worden bereikt binnen 16 minuten. Voor mensen die er op uit willen zijn Bolod Beach, White Beach, Bohol Bee Farm slechts enkele van de attracties die beschikbaar zijn voor bezoekers. Profiteer van de ongeëvenaarde dienstverlening en voorzieningen in dit hotel in Bohol. Dit hotel beschikt over vele faciliteiten die zelfs de meest veeleisende gasten zullen overtuigen. Hotelkamers zijn zorgvuldig ingericht om het hoogste niveau van comfort te bereiken, met beddengoed, draadloos internet (gratis), airconditioning, wekservice, ventilator in iedere kamer. Het hotel biedt fantastische faciliteiten, inclusief massage, tuin, zodat u kunt onthaasten na een bezige dag in de stad. Het Bohol Coco Farm Hostel is een slimme keuze voor mensen die reizen naar Bohol: een ontspannen verblijf is gegarandeerd. Goedkope dorms, fijne plek om andere backpackers te ontmoeten. Het ontbijt is inclusief en heel fijn dat je altijd gratis water en koffie kunt pakken. Het ene moment is het personeel erg vriendelijk en het andere moment heb je het gevoel dat je totaal niet welkom bent. Het eten is naar mijn mening niet heel lekker. Een keer kreeg ik zelfs ijskoude rijst geserveerd. Toen ik vroeg om warme rijst, was de reactie "oh, je wilt het warm?!". Tja.. Jammer dat dit de enige betaalbare optie op Panglao is. Very cheap yet cozy Room. Mostly guest are foreigners. Some of the staff are accomodating and friendly some are snubby and only attends to foreign guest. But overall the place is good if you don't want to spend a lot of money for accommodation especially if you intend to stay for quite a long time. Very nice room for this price. I had to pay 50 PHP for an extra blanket, which I thought was a bit cheap, but very nice services and excursions that are organized in cooperation with the hostel. And free breakfast! Cute little huts. Great breakfast. Perhaps a little far from the Alona Beach but Easily accessible by scooter. Bring ear plugs as the roosters and dogs are very loud at night but overall a good stay. Would stay here again. This place was a piece of heaven, only 10 minutes tricycle ride to Alona beach where everything is! It is also 15 minute walk to white beach which is much more peaceful. What I loved most about this hostel is they can organise everything for you! Transfers to the port, tours, meals, products! The dorms are basic but have fans and mossie nets. There is one hot shower which is lovely to shower outside. There’s even a laundry station. The only thing I think needs to improve is some of the staff - very hot and cold for some reason! Also the food is magical - the best breakfast I’ve had at a hostel! great place to sit back and relax! Far from Alona craziness and close to White Beach. Amazing people running the place, super helpful - good food, great diving - super professional diving instructor in house :) went for 4 days ended up staying 8. highly recommend it! You will feel like at home. Surrounded by trees and birds, super chill place with great people. The stuff is really helpful and the guesthouse has organized trips and island hoping. Wonderful place to meet new people! I was supposed to stay for 2 night and ended up here for a week😁 Enjoy!! Really cool place, lots and lots of potential. Great food and good staff. Showers are awesome and slept really well. To make this place totally awesome it need a communal area that is more laid back, cushions or bean bags would be good, as currently it’s lacking the social vibe that you get with backpacking. Music also needs to be played as it’s very quiet and we were almost afraid to speak. The stay was amazing, super good breakfast, staff and a great chill out area . beds are confortable and the toilets are clean. Not far from the best white beach but a bit far from alona beach (turistic and a bit dirty beach). The farm is amzing too, would love to have a hostel like this in the future. Thanks! this place is like yoga retreat:) it's stunning, simple but nice. staff is helpful and awesome, breakfast is simple but great. the actual place is big with nice common area. clean toilet and shower. you can rent bikes here and arrange tours. a bit away from the touristic area of Alona beach. very close to white beach which is nicer than Alona anyway. they serve food untill 9pm and the food is so yummy, their shakes are to die for .you can buy some drinks here also. overall AMAZING!!! Best customer service. Very considerate. Helps you on where to's, how to's, etcetera in Panglao. Has safari like themed place which is very relaxing. People are warm. Place is near an open beach which is convenient. Facilities are clean. Best place for backpackers! The little hut was very good, the bathroom was clean and I enjoyed the hot shower! To stay in this place, it's better to rent a scooter, because everything is a little far away! it’s really a place where you can meet people from anywhere in the world. if you’re a solo traveler and you want to have some company, this place is awesome. it’s like a village of friendly-minded people with one common goal : to learn our differences but realise we’re all just the same. I can't seem to find anything wrong. Excellent customer service from friendly staff. Food is clean & delish: Restaurant offers vegan and vegetarian options. Even their complimentary breakfast is fresh and healthy. If Im not mistaken ingredients used for their meals is coming from their farm. Oh coffee and drinking water is free. The rooms are simple, clean and nice. The restrooms and shower (hot & cold) areas are in excellent condition (it even smell good). They even have a laundry area! The vibe is homey. I also love how they imparted discipline, honestly and respect to travellers staying with them. No fuss. For example, no flipflops/shoes are allowed inside the room. For food orders, get the menu & order from the staff. Get your own drinks from the fridge & show this to the cashier. After eating your meal, bring your empty cups/glass/plates in the dish basin and separate leftovers. Location: peacful &green! Thanks EJ for the assistance when I suddenly change my itinerary! Cheers! i never thought i could have peace and good deep sleep in this dorm! the cheapest dorm i ever get with free healthy breakfast! The backpackers from all places came to this farm and everyone are well behave and quiet in motion when they are in the room and not too noisy in the common place. You will wake up in the morning with lots trees, sunshine, rooster crowing and bird chirping sound. highly recommended for relax and no rush trip! they even have hammock for relax chilling places! Awesome breakfast and good food at their restaurant, comfortable beds, hot showers available and nice WiFi only in the common area. Clean, spacious rooms, great staff, amazing place for nature lovers, eco-friendly environment.